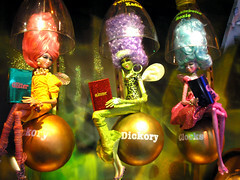 LoLa: Magic at Macy's:Tinsel Queens! I'm glad you stumbled on my blog so I could find yours too. So unique. I love your fleamarket treasures! Hi! I just wanted to say thank you for all your kind words and encouragement. I love your blog and cant wait to see what you have in store for next year! Those are so friggin cute!! I laughed out loud when I saw the them! Love the blog, you never seem to run out of great pics, those faeries are magnificent, beauty parlor faeries with big doos! The coolest thing I've ever seen! You are the best and thanks for ALL your support & friendship in 2008! Hoping 2009 will be a great year for BOTH of us!!! OMYWings- those are cute!! I hadn't seen these. How can I miss a faerie! Love the Tinsel Queens - how cute! thanks for visiting my blog, come again please, and I'll be back to take a good look around! Thanks for stopping by. Hope this coming year is a great one full of promise and wonderful opportunities! Anything from Lisa is always really wonderful! Oh! This is great! I used to do windows for Nordstrom! Reminds me of how much fun it could be when the folks would just turn you loose to create! Love it! That is super cute!! Thank you so much for stopping by my blog, I really appreciate it!! Thanks for sharing the photo of the Macy's window - it is so adorable and I would have loved to have seen it too!